You didn’t think I’d stop at headphones, did you? Analysis of today’s Apple event: iPad Pro, new Apple TV, and the iPhone 6S. After two years of visual and functional changes, is iOS 9 a calm moment of introspection or a hazardous leap toward new technologies? I read an advance copy of this over the weekend, and it’s just incredible. Exactly what you’d expect from Federico. And, an impressive feat, he wrote the entire review on an iPad. 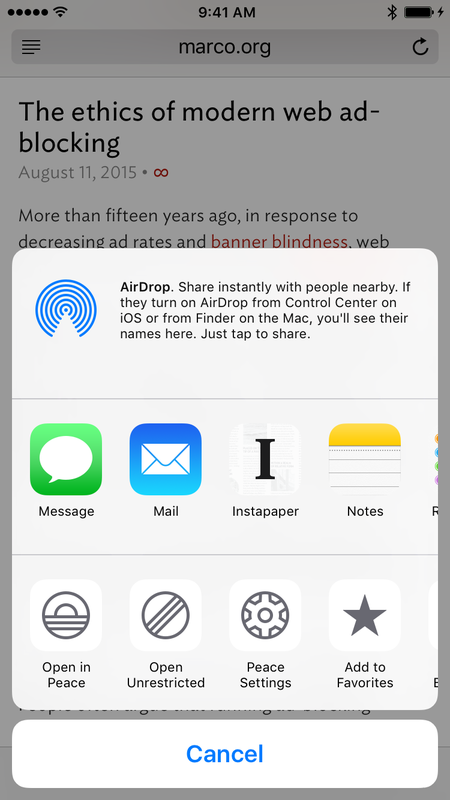 Absent the radical and the revolutionary, then, iOS 9 has to deliver on the promise not of more but of better. After the giant leaps, it has to stick the landing. So, does it? And this is today’s reading. You can’t go wrong with Federico and Rene in general, and especially for iOS reviews. There are a lot of content blockers being released today, but Peace strikes the best balance I’ve seen between effectiveness, compatibility, simplicity, and speed, powered by what I’ve found to be the best database in the business after months of testing. And it’s just $2.99. As I wrote in The ethics of modern web ad-blocking, web advertising and behavioral tracking are out of control. They’re unacceptably creepy, bloated, annoying, and insecure, and they’re getting worse at an alarming pace. Publishers won’t solve this problem: they cannot consistently enforce standards of decency and security on the ad networks that they embed in their sites. Just as browsers added pop-up blockers to protect us from that abusive annoyance, new browser-level countermeasures are needed to protect us from today’s web abuses. Why choose Peace over any other iOS 9 content blocker? Apple’s new WebKit Content Blocker API makes iOS ad blockers so trivial to make that there will likely be hundreds, or more, released over the next few months. Even today, on day one, there’s already tons of competition. 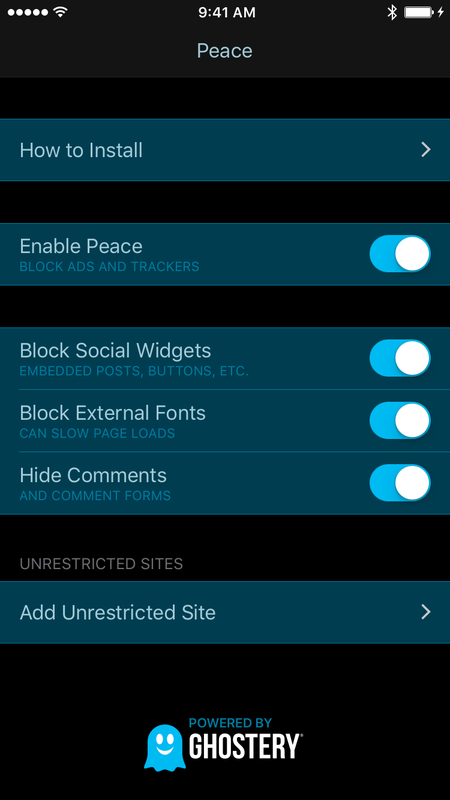 Today, Peace has a number of exclusive features and nice implementation details that I haven’t seen in any other iOS content blocker, but I’m sure they won’t be exclusive for long. Making the app is easy, but creating and maintaining the database of ad and tracker URLs to block is very, very hard to do well. They’re maintained by individuals or very small groups of volunteers, so they’re limited to only what’s encountered by a handful of people. They focus more on visible ads than trackers, leaving a lot of unblocked trackers flying under the radar that their maintainers don’t see. They can’t make exceptions for sites that break when certain ads or trackers are blocked. They can only block at the domain level. They can’t block only the tracking scripts on major sites, or common tracking packages that are hosted on publishers’ own domains. They use a lot of entries to cover all known subdomains of large ad companies, and are often filled with thousands of unnecessary entries for obsolete or very obscure ad servers. Since the browser must check every resource against the blocklist as a page loads, and modern pages commonly include tens or hundreds of resources, bigger isn’t better. The bigger the list, the more time and memory necessary to enforce its rules as pages load. Diminishing returns set in quickly: the ideal list has just enough entries to block most ads and trackers that we’ll encounter on most sites we’ll visit, but not so many that we’re burdening Safari with thousands of entries it will probably never use. Whenever I’d test another blocklist against Ghostery’s, I kept finding the same thing: Ghostery blocked more trackers and had fewer compatibility problems, with a reasonably sized blocklist of about 2,000 entries. After being dissatisfied with every other option, only a few weeks ago, I contacted Ghostery to see if I could license their database for Peace. I thought it was a long shot, assuming that they’d either say no, or that we’d take forever to work out a deal and miss the iOS 9 launch. To my surprise, they loved the idea and we worked out the entire deal in about a week: I’ll make and sell the app and give them a percentage of the revenue. That’s it. The app is completely my code, using a copy of Ghostery’s tracker database hosted on my server that the app periodically checks for updates. With Ghostery’s database, Peace is ridiculously good. This isn’t a time for me to be modest — just go try it and you’ll see for yourself. You’ll reclaim a good deal of privacy, cellular data, and battery power, and you won’t believe how fast iOS web browsing can be. Omit The Deck from Ghostery’s database, carving out an exception for the advertiser used by me and many of my friends. Enforce Ghostery’s database consistently, potentially angering my own site’s advertiser and my friends who use it. And once I looked at it like that, it wasn’t a difficult decision. It’s uncomfortable, but I’d rather be consistent and fair. In Ghostery’s desktop-browser plugins, users can selectively disable individual rules, so you could, for example, whitelist The Deck if you find their ads acceptable. Peace 1.0 doesn’t offer this level of granularity — you can whitelist individual publisher sites, like Marco.org, but not ad rules across all sites. That wasn’t an opinionated decision — it was simply cut for 1.0 to ship in time, and I’ll likely add it in the first update. Whether such “good” ads should be unblocked by default is worth considering. In the past, ad-blockers’ attempts to classify “acceptable” ads have been problematic, to say the least. I don’t know if that can be done well, but I’d consider it if it could. Some people have requested that I distinguish between “ads” and “trackers” in the options. But this distinction isn’t very useful: most ads are also cross-site trackers, so if you want to block most tracking, you’ll need to block most ads. If you want a refund, here’s how you do that. Update: Apple is refunding all purchases automatically. I still believe that ad blockers are necessary today, and I still think Ghostery is the best one, but I’ve learned over the last few crazy days that I don’t feel good making one and being the arbiter of what’s blocked. Ad-blocking is a kind of war — a first-world, low-stakes, both-sides-are-fortunate-to-have-this-kind-of-problem war, but a war nonetheless, with damage hitting both sides. I see war in the Tao Te Ching sense: it should be avoided when possible; when that isn’t possible, war should be entered solemnly, not celebrated. Even though I’m “winning”, I’ve enjoyed none of it. That’s why I’m withdrawing from the market. It’s simply not worth it. I’m incredibly fortunate to be able to turn away an opportunity like this, and I don’t begrudge anyone else who wants to try it. I’m just not built for this business. And again, if you want a refund on Peace, here’s how to get it. I know pulling Peace from the store after just two days is going to be an immensely unpopular move, and subject me to a torrent of unpleasantness. But that’ll end soon enough, and that’s better than how I’d feel if I kept going. Last night, in an effort to improve my morale, I did some low-level technical work on Overcast, which I greatly enjoy. It was a breath of fresh air: rather than a tricky business of messy distinctions and low technical challenge, I got to engage the technical part of my brain and make something great that doesn’t hurt anyone, with no asterisks or qualifications. Today I released a new app Sleep++ that uses the motion tracking capabilities of your Apple Watch to monitor how well you are sleeping at night. This is one of the capabilities made possible by the improvements of watchOS 2. To use the app you need to wear your Apple Watch while you sleep each night. This presents an obvious problem, when do I charge it?. The method is similar to what CGP Grey theorized in Cortex 3. Whether this can work for you will depend on how much you discharge your Watch each day — owners of the 42mm model who don’t use workout mode for very long each day will have the easiest time. Lessons learned from my ad-blocker saga. If you want to skip the follow-up and jump right to the Peace discussion, it starts at 18:00.